The International Federation of Journalists (IFJ) along with South Asia Media Solidarity Network (SAMSN) is running the Digital Security for South Asia’s Journalists campaign from April 7 to May 15, 2016. 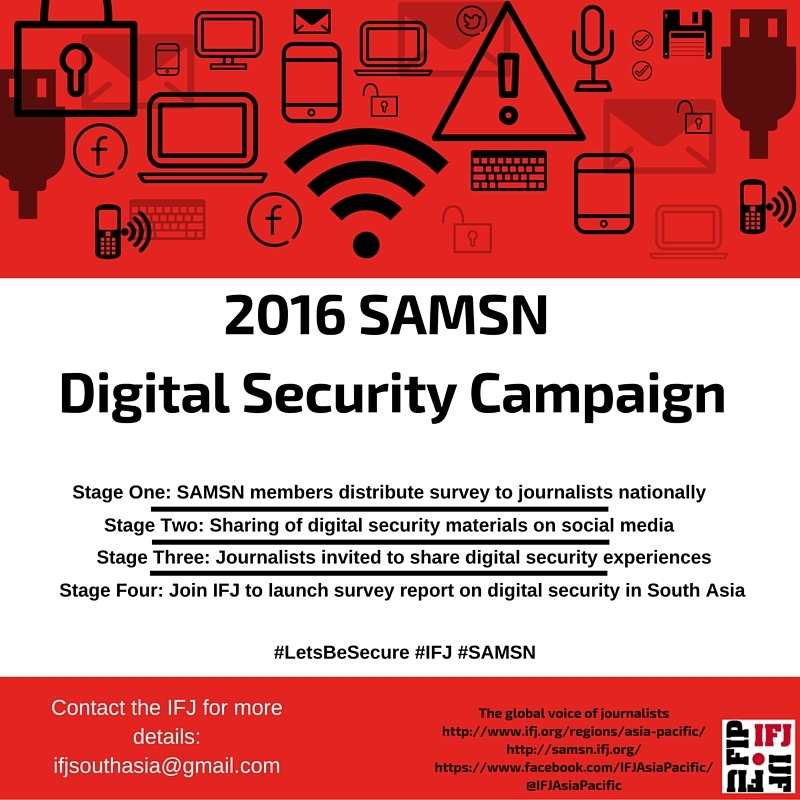 The regional campaign is the culmination of the digital campaign works IFJ and SAMSN have done in 2015 under the UNDEF project, bringing together SAMSN members and the media community across South Asia to campaign on digital security. Digital Security Practice Survey for Journalists: From April 7 to 30, the IFJ and SAMSN survey for journalists on digital security practice will be available online for you to complete and share with your members and networks. The aim of the survey is to understand the digital security of journalists in South Asia and in your specific country. The survey results will be released on May 25. Digital Campaign phase: From May 23 to 31, the IFJ and SAMSN will be taking the campaign online, using social media platforms to promote the messages of digital security. Launch of Survey report: On May 25, the IFJ and SAMSN will launch the survey findings in a report, illustrating the state of digital security for journalists in South Asia. The report will be a precursor for the release of a South Asia Freedom of Expression report that will be released May 31. Visit the Digital Security for Journalists resource page here.